Outcome Health has settled its fight with investors, but the business itself hasn't settled down yet. The company laid off about 20 more people this month, including a number of sales reps who sign up doctors offices to use Outcome's video screens. Outcome, which recently was one of Chicago's fastest-growing young companies, has lost nearly half its employees in less than six months. It bought out 200 employees in late November and laid off about 75 people in September. The River North-based company, which provides educational health content and advertising for pharmaceutical companies on screens and tablet computers installed in doctors offices, has been in crisis mode since fall, when the Wall Street Journal raised questions about whether Outcome was overcharging advertisers and falsifying reports of how much drug sales increased as a result. Investors soon sued for fraud, claiming they also were misled. 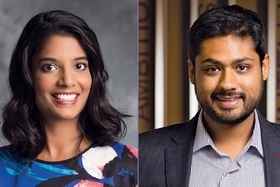 But they dropped the suit in late January after reworking the terms of a $488 million deal, struck last spring, that would have provided founders Rishi Shah and Shradha Agarwal with a $225 million payday. Investors sued to freeze the $225 million. As part of the settlement, the founders are putting $159 million into the company, about half it to pay down debt. But there was no new capital from investors beyond the original $488 million, as first reported by the Wall Street Journal. The company did not make this clear at the time the settlement was announced, even when asked specifically whether outside investors also were putting in more money. The board, which previously consisted of Shah, Agarwal and a representative from Goldman Sachs, which led the high-profile deal that included Pritzker Group Venture Capital, was increased to seven members. Two of them will represent the outside investors, and three will be independent directors. Shah and Agarwal have stepped down from their CEO and president roles, respectively, and will become chairman and vice chairman. Shah remains the largest single shareholder, and the founders still own the majority of the company's stock. The company is searching for a new CEO while trying to get the business back to normal. But that's not likely to be achieved anytime soon. At least a half-dozen of the people involved in the most recent round of cuts, on Feb. 16, were involved in signing up doctors offices to use Outcome screens. That team, which used to employ more than 70 people, is essentially shut down, said a source familiar with the operation. When the company raised money a year ago, it said it had screens in more than 40,000 doctors offices. The primary challenge at this point is convincing advertisers, some of which reduced or stopped spending money with Outcome since the scandal unfolded, to use the screens already in its network rather than signing up more doctors. The company declined to comment on specifics of the layoffs but said in a statement: "We continue to recruit and hire exceptional people to fill positions that are critical to our customers' needs, future growth and improving patient outcomes. This process also includes making difficult decisions about areas where we may have redundancies or staffing levels that do not match our priority areas." "More layoffs at Outcome Health" originally appeared in Crain's Chicago Business.